I use the juxtaposition of death & the digital age as a lens to examine the way we think, live and relate in an information society. Try this. For the next few days, as you move through the world – making your choices, reading the news, talking to your friends and family – set yourself the task of noticing how often the topic of privacy rears its head. Maybe it’s not called that; maybe it’s a kind of underlying theme, thrumming underneath the surface of a situation without being given its name. But it’s there. There are a dozen or more moments a day when we might be able to stop and say, “You know, this has a lot to do with privacy, really.” And just why is it such an ever-present theme? The answer won’t shock you. Modern privacy is the hapless, weary lab rat of the information age, constantly scrutinised under the microscope, continually tested, always under investigation. We have to keep our eye on it, because it’s got a bit out of our control. We used to know what it was, you see: how it worked, how to govern it, what laws applied to it. But then – not gradually, not bit by bit, but quickly, in a tsunami of bytes – everything changed, and the concept of “privacy” mutated too. Every day privacy is tossed into the searingly hot crucible of the digital environment, its integrity challenged, its properties and limits shifting and morphing. This metaphor I’m using positions us as people who can study and control things, but that probably isn’t right for this context. That doesn’t represent our relationship with privacy at the minute, individually or collectively, in the online environment. We don’t feel in control of much of anything. We’re not clever scientists. We’re clueless smallholders closing our stable doors after all our horses have bolted, wondering how this happened, mouths agape, catching flies. The Merriam-Webster definitions of “privacy” are sort of useless in the digital age, because they create as many questions as they answer. “Seclusion”? What’s that? When our virtual connectivity is taken into account, when are we ever apart from company or observation? What constitutes an “intrusion” these days, when we share so much of our personal data, knowingly or unknowingly? And “unauthorised”? If we wanted to be 100% clear about what we were and weren’t authorising, we’d be signing away the majority of our free time. Five years ago, The Atlantic reported that if we read and understood all of the privacy policies we encounter in a year, we’d lose 76 working days annually. Five years ago. I shouldn’t like to hazard a guess about much more time it would take in 2017. The consequences of not reading the T&Cs of what you’re signing up to, with respect to privacy, came home to me recently. I listened to an episode of the Reply All podcast, all about whether Facebook is really “listening” to us via our smartphones. Following their instructions, and with a sense of foreboding, I did something I’d never done before – I looked into the advert settings to see how I’d been “categorised”. My second reaction? Skin crawl. I knew that this wasn’t technically “unauthorised”. I simply hadn’t paid attention, hadn’t un/ticked certain boxes, hadn’t assiduously reviewed my settings at every app update. Even so – even though I knew such technologies existed in the world, and that we are all constantly, silently plugged into more algorithms than we can count – it felt creepy. I hadn’t realised my categories were visible to me; bringing them into the light and looking at them straight on had an “ick” factor that I didn’t anticipate. Third reaction? Definite displeasure. Authorised or not, it did feel like an intrusion. But an intrusion on what? Into what? I didn’t really care, actually, that Facebook “knew” that I buy cosmetics, that I have a family, that I engage in travel, that I wear jewellery. Follow me or talk to me for five minutes, and you’ll figure this out. It’s hardly a secret source of shame; I don’t consider these data to be “private”. So what was my umbrage about? Why did it feel like such a liberty? The questions I’ve found myself asking are not exactly about what privacy is. Instead, they’re about what privacy is for. I had that discussion with students yesterday on the MSc in Cyberpsychology at the University of Wolverhampton, when we were talking about whether dead people had the “right” to privacy. Traditionally, rights in general, and privacy in particular, are the province of “natural”, or living, persons. What good is “privacy” to a dead person? What’s it for? The answer, these days, is intimately connected to digital legacy. If an image of you is going to persist online after you’re dead, what do you want that image to be? Would you like to think you’ve got some say over that? When you think about someone altering or fundamentally messing with that image after you’re gone, or about someone logging in and reading your private messages, does that upset you? Would you like to believe that you’re the author, as much as possible, of your own lasting legacy? My daughter is seven years old. Over the summer, visiting the States (you know, the place from which I am expatriated), I took a lot of photos. Being the only one in the family with a camera constantly in hand, I serve as the chronicler. I posted dozens of images on Facebook and Instagram. They were there for the record, to be shared with the people who were there and who didn’t take snaps themselves, and to be enjoyed by friends back home in England. Zoe knows that I share these things and often encourages and expects it, but perhaps it had all got a bit much. One day I saw that the door of the room where she was staying was firmly closed, and Sellotaped onto it was a sign. “I know one of your secrets,” issued a severe-sounding voice from the back. “I’m sorry,” I replied weakly. “It’s my choice,” she said, with emphasis. That’s it. That’s the whole of it. There wasn’t anything secret behind that door. There wasn’t anything sensitive about that sign. But it was her sign, her writing, her room. It was her choice. Fundamentally, her privacy in that moment had nothing to do with that sign and everything to do with self-determination. She had attempted to limit the audience with which it was shared, I had overridden that attempt, and here I am doing it again. These conversations with my daughter, and my little excursion into the midnight zone of my Facebook privacy settings, have helped clarify what I think the fundamental function of our privacy-focused behaviours are. Privacy is about self-determination. It’s about retaining the power to say this is who I am. This is what I value. This is how I choose to present myself to the world. This is how I identify, this is how I prioritise the different facets of myself. This is the access to me that I will allow you. Of all the things about myself that I consider to be important and valuable, “ex-pat” – a term I hate, a concept with which I no longer identify – is very last on the list. Facebook had it listed as the central feature of my existence. So I asked Zoe if I could post this photo on this blog. She said yes. And then, methodically, I went through and removed every “ex-pat” category on my Facebook advert settings. I’ll choose how I classify myself, thanks very much. We’re reaching a point where most of us have personal experience of some kind of intersection between death and the digital world. People may hear about the loss of friends and family via social media. They may struggle with online platforms for control over or access to information about their loved ones’ digital legacies. They may use a friend’s Facebook site for mourning and memorialising them after they are gone. They may wonder what will happen to their own online material after they die, and some may even decide they’d like to maintain their social lives from the Great Beyond. Throughout the remainder of 2017 and the start of 2018, I’m writing a book for popular audiences about all of these phenomena. It’s called All the Ghosts in the Machine, and it’s published by Little, Brown UK and an as-yet-to-be-determined publishing house in the US. If you have a story that you’d like to share with me, I would love to speak to you about a possible interview for inclusion in this book. Please do reply to this post or email me on info@alltheghostsinthemachine.com . I also speak frequently about this topic to various audiences, including the public, psychological practitioners, and academics, so if you are a journalist, producer, or representative of an organisation that would like to discuss this with me, please feel free to get in touch as well. For more about the book, read on! This is an extract from the original proposal, describing what All the Ghosts in the Machine is about. This is a book about unintended consequences. Mark Zuckerberg and his colleagues launched Facebook to connect students at Harvard, not to create a mixed-use social networking platform and digital cemetery. Skype was designed to enable us to chat to one another, not to live stream funerals. In short, when the whiz kids of Silicon Valley created the technologies that we now use to capture, store and share massive amounts of data, it was the living consumer that they had in mind. And yet here we are, the dead and the living, still segregated in the corporeal world, but mixing and mingling like mad in the digital sphere. That situation is tantalizing and comforting to some, surreal and horrifying to others. Whatever one’s gut reaction, though, those who think that this phenomenon does not directly affect them will be surprised at the number of ways that this assumption is untrue. We are at a tipping point of awareness: more of us are realising that one day this issue will prove personally meaningful to us, but most of us have no idea just how complicated and multifaceted this issue is. In the realm of death, as in much else, the digital revolution changes everything. It has been said that we are not truly dead while our names are still spoken. In a technological landscape where it is more difficult to forget than to remember, the dead are still spoken about a lot – in fact, they may continue to “speak” themselves. The ability to stick around in digital form holds out the prospect of a kind of immortality. Through making connections with our dead easier than ever before, these very modern technologies may draw us back to quite ancient ancestor-veneration practices; our predecessors’ presence is more apparent and actively influential in society than has ever been the case before. Realizing that it is not just the great and famous who may have their legacies preserved, but all of us, do we make different choices in our lives? How do we respond to the persistent echoes and reflections of deceased loved ones online, or otherwise in digital form? Knowing that one day we will be one of them, how do we manage our own data? What happens when corporations compete with us for control of those data? And could the phenomenon of technological obsolescence eventually prove that a granite headstone memorial was the better option all along? This book is about all levels of this fascinating and thorny territory: psychological, sociological, practical, legal, spiritual, ethical, and commercial. It will tell the stories of people who have confronted unexpected and complex dilemmas at the many junctions where death and life meet online, help readers with their own confrontations with these challenges, and explore the implications that these fascinating new developments hold for all of us. The Death Goes Digital podcast! A lot has happened since I last posted on my WordPress site! I got a fabulous agent – Caroline Hardman of Hardman & Swainson – and secured a book deal with Little Brown UK. I’m extremely excited about writing All the Ghosts in the Machine, which is my first non-academic book. I spend most of my days writing at this desk. A few weeks back I sat at that same desk and had a great conversation about the book and the topics covered in it with Pete Billingham of Death Goes Digital. That conversation was lovingly crafted into a podcast, which has just been published today. 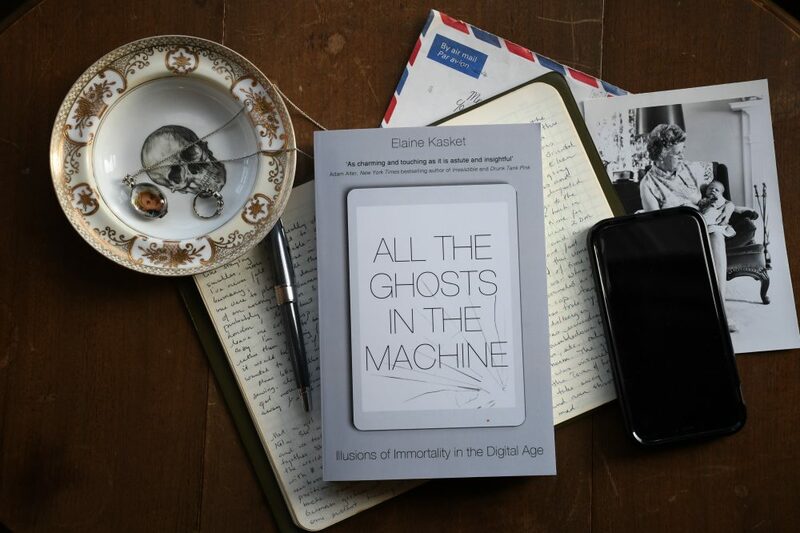 Please do have a listen – you can also download it as a podcast from Apple – and if you have a story of death in the digital age that you think needs to be told, email me on info@alltheghostsinthemachine.com! Legacy Contacts – Have you Considered Yours? Shortly before Christmas I spoke to BBC EMT a couple of times about legacy contacts. The Forgotten Bridge in process reports. It’s that time of year again, and I’m marking process reports; it feels topical, therefore, to repost this blog entry I wrote for my friends at London Counselling Psychologists. Luckily, I’m marking those of my own supervisees, who have learned these lessons well (for which read: have had these lessons relentlessly drummed into their heads). For anyone who doesn’t fare as well on first assessment, you might want to consider whether these pointers could help you. What’s a webinar, anyway? Basically, I’ve taken the core messages about the doctoral research process from the research methodology courses that I teach on a professional doctorate in counselling psychology, and I have translated them into an online seminar format. You can log on from home; you can see all the slides and hear me speaking; and you can either listen in on or participate in conversations with me about personal dilemmas in matching research question and methodology. You’ll also get the chance to receive personal feedback via email about your own research question/methodology match. Students rate my lectures highly, and I received excellent feedback on the first webinar (Developing Your Research Question) – even from webinar sceptics/newbies! Click on the picture above for a link to registration and more information about the contents of the webinar. Hope to see you there! Click above for link to full article, to which I contributed during my visit to Dublin for the Irish Childhood Bereavement Network conference. Well, here we are, the last fiddly bits! All the corrections are marked up and ready to be transferred into the electronic file to send back to Little, Brown...roll on Xmas, audiobook recording, and publication! Link for tickets in bio. See you later?